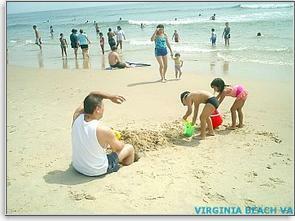 Virginia Beach is a seaside resort city located in perhaps the most historic spot in the United States. From its early role in colonial history the city has grown to become one of the country's most beautiful resort locations, with a thriving tourism industry that serves millions of tourists each year. Major employers in the area include the hospitality industry as well as the military. The city is also home to great golfing and fishing opportunities, as well as many other outdoor pursuits. And the area's beaches are world famous: miles and miles of sand bordering the surf of the Atlantic Ocean. The first English colonists landed at the present-day site of Virginia Beach in 1607. While they were no doubt seriously contemplating their future in the new world, it is likely that at least one took a look around at the tremendous natural beauty of the area. The area was rich in plant life, including dogwood trees and jasmine flowers, and wildlife was abundant. The colonist moved further inland to be safe from invaders, and it was several years before the city of Virginia Beach was founded. One of the earliest settlers in Virginia Beach was Adam Thoroughgood, who built a large brick home that still stands in the Lynnhaven area today. 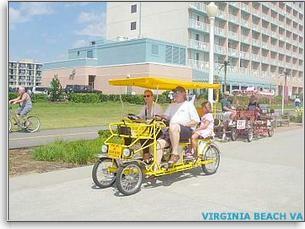 Throughout the twentieth century, Virginia Beach was a popular tourist destination. The area became famous for its Boardwalk, and many of the city's streets were immortalized in the classic board game Monopoly. The military was quick to recognize the city's value as a training center, and Oceana Naval Air Station hosts many of the Navy's top pilots. The deep waters of Chesapeake Bay are also home to the Little Creek Amphibious Base, and so the city has many military families living in the area. A walk along the beach will show Virginia Beach's most attractive feature, however, and the beachfront strip is home to many hotels and resorts. The city of Virginia Beach is rich in history, and it is also one of the most popular tourist destinations. With great attractions, a moderate climate and a welcoming nature, Virginia Beach is a great place to visit. Site Design by Beach Web Design Copyright ©1999-2007. All rights reserved.